The history of theater runs deep, and in New Mexico, you’ll find lavish buildings that have been an important part of the state’s culture for decades—some even a century. These beautiful theaters represent an era of architecture and culture. With these iconic spaces being maintained, restored, and renovated, you can still catch live performances in them today. Here are 10 incredible historic theaters in New Mexico. Coal mining dominated this town for more than 100 years. When mining stopped, the town regrouped and is now a hotspot on the Turquoise Trail. The theater, housed in train engine repair shed from the 1900s, seats about 135 people who can cheer and boo at the actors in the old-time melodramas that take place in summertime. There’s a full-size steam engine on stage, old maintenance pits along the aisles, soot and steam stains on the roof and a balcony made from railroad tracks. Silver and copper mining helped establish the town in its earliest days. The name SilCo pays homage to that history. This theater went through a number of transformations—movies, furniture store, mini-mall, boutique—until it was refurbished and reopened in 2006 as a movie theater and facility for events and meetings. It has a one screen, 156-seat all digital movie screening room and a lot of small-town charm. This 1950s-style movie theater, operated by Frontier Theatres, was originally named the Sierra Theater and boasted a 17-by-38-foot screen. In the 1980s, it was purchased by a local resident, Margaret Flickinger, who donated it to what is now known as the Flickinger Center for the Performing Arts organization. Now, this refurbished 600-seat theater offers a variety of entertainment from concerts to plays and musicals to dance recitals by both professional and amateur groups and is a performing arts anchor for the downtown. In 2009, the town purchased this historic theater, a source of community pride and a popular landmark. Originally built in 1915 as the Mission Theater, it changed hands and was renamed the Luna Theater in the 1930s. Because of its mission/Spanish revival and Art Deco-style architectural components, it was listed on the National Register of Historic Places in 2007. At one time, the basement was a ballroom and roller rink. Now, the building is a legendary venue for movies, with updated digital projection and surround sound. The winking, smiling moon face on the marquee is a delightful, working blast-from-the-past. Billed as a “castle of pleasure and art” in 1928 when it opened, this Carl Boller designed building with its Spanish Colonial-style exterior was restored in 1991 and is now used for film exhibition and performing arts. The 450-seat theatre, which shows popular movies, is outfitted with Dolby Digital Sound and a high-end Christie Digital projector. The atmosphere is reminiscent of the movie heydays of the 1940s and 50s when going to the movies was an event. Lots of fresh popcorn, hotdogs and comfortable seats. In 1948 when this theatre was built, the simple, clean, straightforward look of Art Deco-style was immensely popular. The architecture of this theatre, with its ceramic tile facade and triangular marquee, captures that style. In 2007, it was listed on the National Register of Historic Places. Today, audience goers watch current and popular movies in the state-of-the-art digital display and sound 400-seat theatre. Once inside, don’t miss the Plains Indians and cowboy murals by local artist Albert Perea. This more than 100-year-old theater was built at the turn of the 19th century as a place for opera, live theatrical performances and concerts. Today, its original purpose lives on, continuing to showcase live plays, drama, comedies, musical theater and concerts for all ages for the local community. Renovated in the 1960s, the interior has some beautiful remnants from its earliest days including three original drop curtains depicting beautiful scenery, an original restored box seating area and eight WPA (Work Progress Administration) murals by artist Manville Chapman from the 1930s showcasing Raton in the 1840s. This beautiful building is a Registered Cultural Property in New Mexico. The definition of “odeon” to the ancient Greeks and Romans was a place for musical performances. While those types of activities didn’t take place at this Art Deco-style theater built in 1936, the name sent a message about entertainment. The theater is now the oldest remaining movie theater in downtown, still showing first-run Hollywood movies, just like at the height of its popularity. 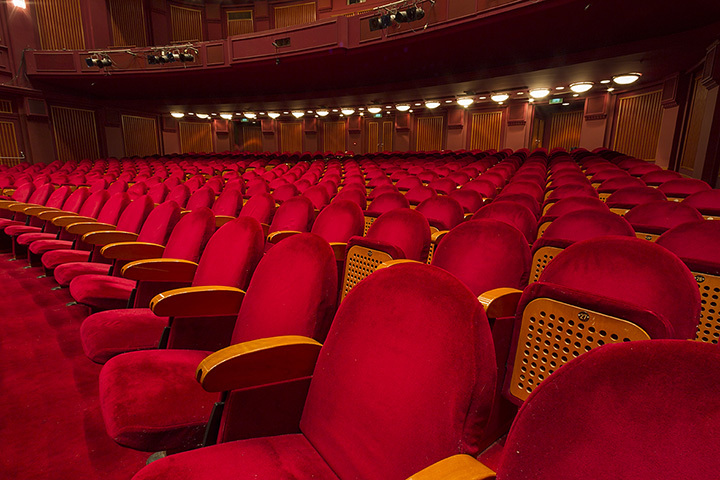 The small theater seats 270 and has been updated with the latest digital and audio technology. In 2007, it was added to the list of National Register of Historic Places. Known as the Puccini Building, this historic theater is the setting for what could be considered a modern-day opera. It’s named for Luigi Puccini, cousin of the famed 1920s opera composer Giacomo Puccini. Luigi’s future wife thought she was going to meet the famous composer, but instead, upon meeting Luigi, fell in love with him. They built the El Rey as a movie theater in the 1940s. It’s been in the family, off and on, since then. Now, as a Registered Historic building, this lovely example of Mediterranean architecture, the only one in the state, is a cornerstone of downtown as a live music and concert venue. The Cavern, with the help of the local community, has undertaken a complete renovation of this unique local downtown building, with the intent of transforming it into a multi-purpose performing arts venue. It was built in 1951 and is an excellent example of the modernistic International Style of architecture popular in the 1950s. Its movie era ended in the 1990s and has been used sporadically throughout the years for musical performances and other events. The Cavern is well down the path to a successful completion of this project and does off-and-on utilize it for fundraising efforts. View more New Mexico Theaters and Playhouses.